Yasaman Kazemi, PhD student in the NDSU Transportation and Logistics Program and graduate research assistant with NDSU's Upper Great Plains Transportation Institute, presented a poster titled "Application of GIS in Modeling the Supply Chain Network for Auto Industry in Midwest" at the North Dakota/South Dakota Engineering Research Summit at South Dakota State University April 23. Through her research, Yasaman developed a spatial interaction model for the auto industry in the Midwest based on minimum cost. She then integrated the model into a highway transportation network to predict the minimum flow from origins to destinations by choosing an optimal sequence of routes to minimize the total cost of the supply chain network. 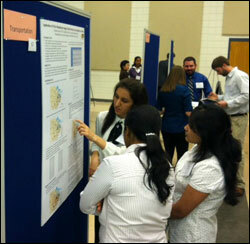 The poster presented the idea of utilizing GIS to model the supply chain using the real highway network. The North Dakota/South Dakota Engineering Research Summit gives graduate students and faculty from the engineering colleges at NDSU, UND, and SDSU the opportunity to meet, share their research, and encourage cooperation among the institutions.